For the past two years I have been really struggling to get clear skin. Either I would get an outbreak on my forehead full of inflamed tiny little pimples along with the pimples on either side of my chin. Nothing is worse than not feeling confident and positive in your own skin. I've been using all kinds of different scrubs, skin washes, toners. Nothing seemed to work. Some products even made my skin worse than before! So for the past month and a half I've finally seemed to have found the gold on the other end of the rainbow (ok, thats a little to dramatic). I'm a big believer in using natural skin products, especially after having used so many products that have consistently failed, or even made my skin worse. There aren't any nasty chemical skin strippers or hidden nasties in these products. I have genuinely felt a big difference in the texture and feel of my skin also. It's much softer and less oily. The tea tree range from The Body shop has definitely been a big life saver for me. My skin is still not entirely clear, but I have seen a difference the redness has significantly decreased and unlike all the other products I've used it hasn't left me with overly dry/oily skin. 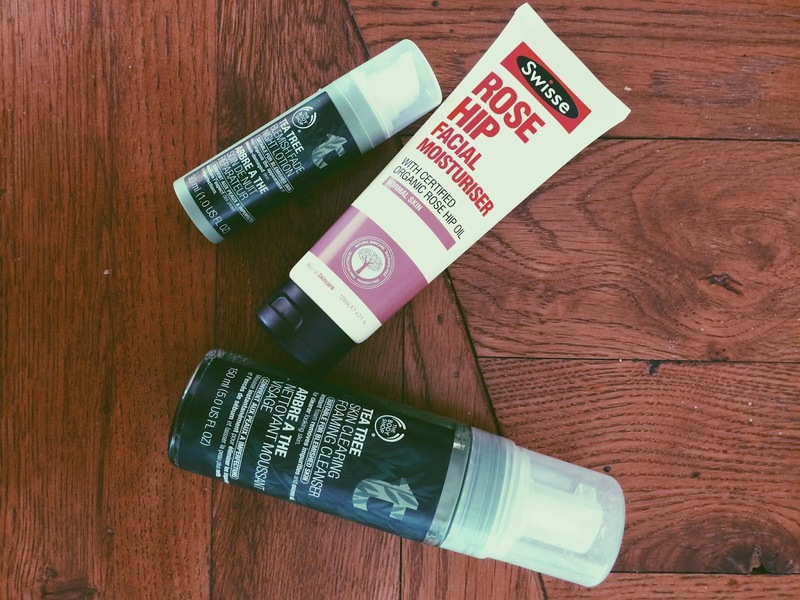 To hydrate my skin i've loved using the Swisse Rose Hip moisturiser. With a lot of moisturisers i've found that my skin can be extremely sensitive and cause a reaction to it. When applying the Rose hip moisturiser I only have to apply it once in the morning and it leaves my skin feeling nice and soft for the rest of the day. I hope you found this little post helpful. Being natural skin products I feel that they range in very affordable prices and your skin will love you for it also.